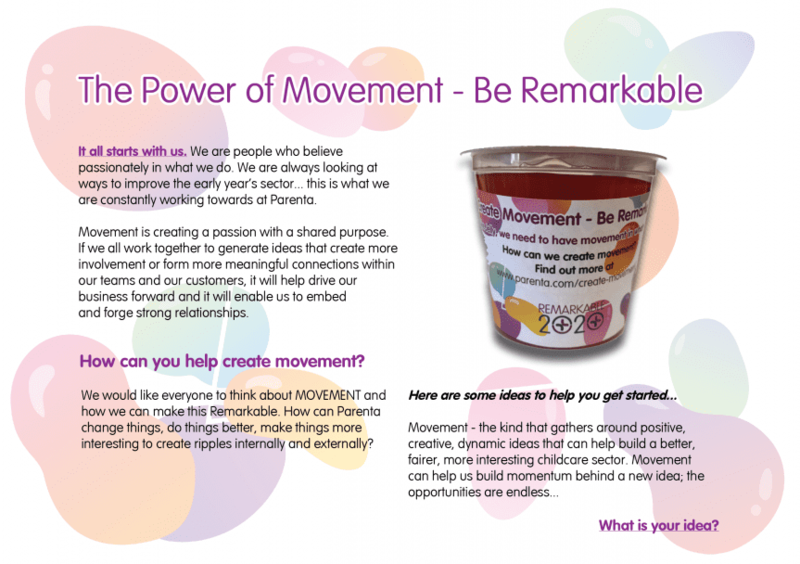 To create movement we should invest in staff as they will help create movement by being motivated and passionate about Parenta. We need to ensure staff understand all jobs within the company and have an opportunity to shadow other team members, we should have an employee of the month, recognise staff who go above and beyond their job role regardless of whether they are customer facing or not. Offer training courses to develop our staff. We should have a staff suggestion box, this would create movement because team members will come up with fresh ideas. Our staff are what makes Parenta special. I have seen some one has said it would be good to shadow other departments within Parent. My suggestion would be to see if we can team up with other training providers for a few of us to observe and look at the work others do within other companies. For example and assessor could look to see what workload, other assessors have within other companies. They could look at the resources, systems and process of the other assessor to see if there is any positive practice they could bring back to use if they feel it could benefit Parenta. In order to create movement, it should be encouraged internally. Through facilitating progression and development within the company, Parenta would ensure that the skills of its most loyal, talented and motivated colleagues are being utilised to allow them to be remarkable and to create movement for their customers and learners – to greater heights and new opportunities! I think that Parenta staff should hold webinars that our childcare providers can sign up to on industry related topics. I think it would be a great tool to show how knowledgeable our staff are in all areas of childcare and will help build our reputation within the industry. The webinars could cover topics such as 30 hours funding, GDPR and any other changes or updates that affect our customers and their businesses. I think these should be held by all kinds of staff members in all different departments depending on the topic and should be shared across all social media platforms – Especially LinkedIn, Facebook and on our website. We can also add links to these webinars within our software products for easy access and hold software specific ones too (for example, ‘how to get the most out of your Abacus system’ or ‘Abacus top tips’). We really need more functional skills support for Maths. I really like the idea of webinars. This would then reduce the amount of OOFS. We also need to sort something else out with regards invigilating exams. This is so time consuming and Assessors are not able to do anything whilst invigilating, other than watching the screen. If you have to invigilate two exams in a day, this doesn’t leave much time to do anything else. Look into an internal communication system like Yammer, it’s a facebook type thing but for businesses, it would be Parenta’s own social network. We had it at my previous company and now after not having it for a few months, I can really see how fantastic it really was for connecting everyone. You can have private groups for departments, share things company-wide. It’s great for connecting remote workers and office workers as well as generally bringing people together, helping to share all the great things the company is doing and connecting the dots. I can’t emphasise enough how brilliant it is and I think Yammer or something like Yammer would be really beneficial to Parenta. Fun videos for each software product and service we provide, like we have for Dayshare. Route planning for external based staff to minimise the amount of traveling per visit. We should be ensuring that the employers that we are working with are following the new rules that apprenticeships must include 20% off the job training and challenging them where this isn’t happening in all areas of the business, including sales, recruitment and training. I have a personal experience of a poor apprenticeship with one hour off the job training in a six month period and ended up speaking on the news about the company and campaigning for improvements in the apprenticeship sector. Although this is an extreme, it has made me passionate about wanting to provide the highest standard of apprenticeship possible. We should be seen as a provider that will only work with employers who will be supportive and treat their apprentices fairly and therefore the provider that candidates come to if they are seeking a childcare apprenticeship. We need to ensure that going forward, any release date or deadline announced to our customers and members of staff is met. When you continually deliver on time, you establish a reputation for being a reliable and dependable business. This will increase consumer confidence and help build a repeat customer base. Our customers will know that they can count on us to do what we say when we say it. I think it would be a good idea to have forum’s for our learners to interact with one another and where we can add video’s and answer questions. I think we should each have our own profile, similar to the layout of a facebook profile, and have the link to our profiles in our email signatures so that the managers, learners and candidates we speak to can feel like they know us better and build more of a relationship with them. The information on this profile could include a general statement at the top explaining our job role at Parenta and what we do to help, a picture of us (not the standard passport picture, something more approachable and friendly!) and our interests, hobbies, etc. I feel this would especially benefit our young candidates that we help to find apprenticeships as we are asking them information about themselves in order to assess their suitability for the roles and this way knowing more about us might make them open up and feel more comfortable. We should give hard copies of the Parenta magazine to our learners on sign-up, with a leaflet asking them to contribute their own top tips, advice and funny stories. This would open up and share the learner journey with all our readers, and is a great way to get everyone involved in helping to create insightful content for the monthly magazine. Employ 4 remote sales person for South West, South East, Midlands & North to target the blank areas across the country that Parenta are missing! Massive potential and it frustrates me watching other providers take up business we could have! Settings like face to face guidance during sign ups & I feel the remote area’s are missing this oppertunity to really share What Parenta has to offer! We should offer “Employability” sessions to our candidates to help teach the importance of interview skills and techniques, letter, application and CV writing along with communication skills. These are topics they are slowly phasing out in schools meaning the candidates we assess for suitability within recruitment are sorely lacking in these fundamental building blocks. We deliver elements of these courses in our roles within recruitment but why not offer a recognised qualification alongside? I used to deliver these sessions in my old life as a teacher and tutor, across all age groups and the increase in confidence and personal development is clear. When designing software or when thinking about our website I think we should ensure that we are designing colour-blind-friendly content and also make sure that we provide options for people that need the text bigger/smaller. We could provide an option where we have a voice read out for people who use our website or software products so we make accessibility easier for our customers with additional needs. We should offer the level 2 free courses. They include Understanding Autism, Managing Behaviour and Equality and Diversity. They are workbook based and are completed in twelve weeks. They are free to the learner and would mean we could offer a learner a course while waiting to hear about funding etc while awaiting main qualification. As manager of a setting I use these regularly with my staff. They are excellent CPD and would give assessors a good access point to a setting. I have completed the courses myself and they are great and support teaching! We should ensure that we survey our candidates, learners, managers and internal customers regularly at various stages of their journey with us to assess exactly where we are remarkable, becoming remarkable and where we need to challenge what does not work. If we strive to be as adaptable as the industry dictates we will not only lead the market but encourage our young people to work in this exciting industry as a long term aim rather than what is sometimes a stepping stone while they decide what they want to do. Not sure how feasible this would be, but everyone shadowing parenta staff in a different role to you- assessors can buddy up with someone head office and shadow each other. This will help give an insight and appreciation for what other’s do in the company and help to understand each others importance and place in the cog of the parenta wheel. For learners: I agree with Adele- making more video’s – especially to help with understanding concepts for functional skills. I think we should have assessors and tutors, within the company. When learners sign up, then should agree to group learning sessions over Skype once ever 2 weeks, so that theory can be delivered in groups. Then assessors observe, complete guided discussion and support any idividual learning needs. We could shadow a member of staff from a different department to gain an understanding of their role. This would give us all an understand of different elements of the business. We could arrange group test days at the weekend in central locations. We could also employ exam invigilators. We should do more engaging and fun videos to appeal to our younger learners.